MOSCOW, Russia -- Russian Defence Minister Sergei Shoigu on Thursday blamed the United States and its allies for the conflict in Ukraine, saying their drive to bring Kiev closer to the West was a threat to Moscow and had forced it to react. 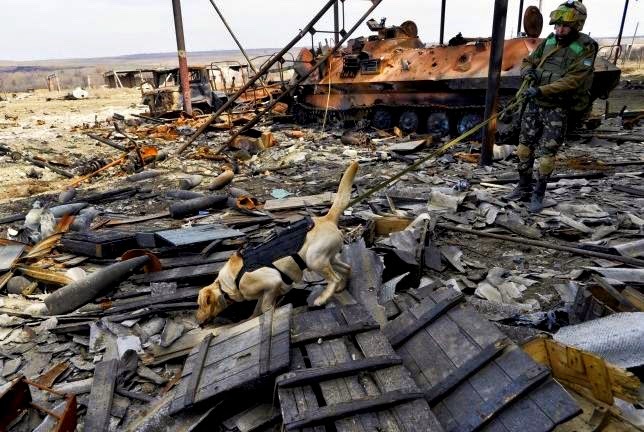 A Ukrainian serviceman with a dog takes part in a search operation to deactivate and destruct ammunition in the settlement of Luhansk, Donetsk region. Speaking at an annual security conference, Shoigu accused Washington of seeking worldwide military and political dominance. He reiterated Moscow's line that the West orchestrates "color revolutions" to unseat rulers it dislikes. "Ukraine is the biggest tragedy in the chain of color revolutions. The United States and its allies have crossed all possible lines in their drive bring Kiev into their orbit. That could not have failed to trigger our reaction," Shoigu said in Moscow. 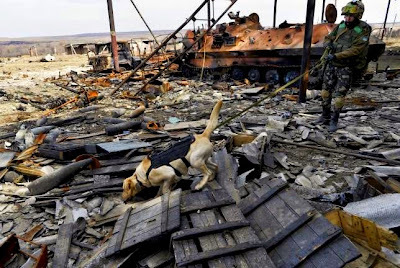 Russian annexed the Crimean peninsula from Ukraine last March and separatist unrest then spread to eastern, Russian-speaking regions of the country. Fighting between Kiev's troops and pro-Russian rebels there has killed more than 6,000 people. The West says Moscow has sent serving Russian troops to help the rebels as well as arms, training and intelligence. Moscow denies direct military involvement in spite of mounting evidence on the ground. Shoigu blamed the fighting on Kiev and its drive to integrate with the West. "How many more casualties are needed to force Ukrainians living in the east to feel 'Europeans'?" he said. He dismissed Western criticism that Russia was forcibly remaking European borders, pointing to Western military involvement in Serbia, Iraq and Libya. "Those vehement critics of Russian actions in Crimea surely have no moral right to accuse us of violating international law," he said. Shoigu said Moscow saw the development of the U.S.-led anti-missile shield in Europe as a threat to its strategic nuclear deterrent capability, and was taking measures to counteract it.